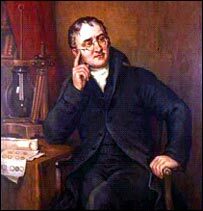 When John Dalton walked in front of a meeting of the Manchester Literary and Philosophical Society on 21 October 1803, he began a revolution. At a stroke, his new theory of atoms crushed the alchemists and their magic formulas for gold. He had set chemistry on the path to becoming a modern science. "The crucial step was to write down elements in terms of their atoms; instead of talking about water, you talk about its constituent hydrogen and oxygen," says Nobel Laureate Professor Sir Harry Kroto. "I don't know how they could do chemistry beforehand, it didn't make any sense." 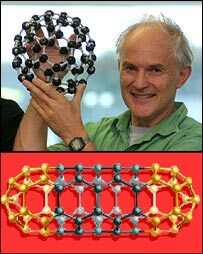 Professor Kroto, famed for his co-discovery of carbon "buckyballs", will deliver a Royal Society of Chemistry lecture in honour of Dalton this week. It is just one of a series of events being held in northwest England in October to celebrate one of the region's most famous sons. The idea that all matter was ultimately composed of very small indivisible atoms had already been bounced about in Greek times by philosophers like Democritus. But it was Dalton who showed that atoms must exist - and more. "Dalton made atoms scientifically useful," said Rajkumari Williamson Jones, a science historian at the University of Manchester Institute of Science and Technology. The important discovery was made when Dalton investigated, with a chemist friend, how gases could be absorbed by liquid in order to aid production of medicinal soda water. "Ultimately, it was all down to fizzy drinks," Mrs Jones said. The hypothesis was that gases differed in the quantities that would be dissolved in water. Dalton proposed that this was due to the nature of the particles - the atoms - that made up the gases. It gave him the first table of atomic weights. "He basically found a way 'to weigh' atoms," said David Garner, professor of chemistry at the University of Nottingham, and head of the Dalton Division of the Royal Society of Chemistry. Atoms may have subsequently been split in the last century, but how they combine to form a simple substance like water or the more complex molecule DNA, the basis of life itself, is as Dalton described 200 years ago. Dalton's theory gave structure and order to the mass of chemical data available at the time. He invented a new way to denote chemical elements and their compounds which enabled science to gain an understanding of the properties and interactions of different substances. Professor Kroto told BBC News Online: "It was a revolution at this point beyond imagination." Dalton's discoveries also had practical implications. "His theory brought economy to manufacture of chemical compounds," said Mrs Jones. "Manufacturers would know for example exactly how much sulphur to add to make sulphuric acid." Although Dalton's own measurements of atomic weight could not be very accurate - and he even got the chemical formula for water wrong - his ideas and approach proved right and still spur research today. "Now, with nanotechnology, atoms are the centrepiece," Professor Garner said. "Atoms are manipulated directly to make new medicines, semiconductors and plastics. "Dalton was the first nanotechnologist. He gave us the first understanding of the nature of materials. Now we can design molecules with a pretty good idea about their properties." Today's nanotechnologists aim to assemble new materials atom-by-atom, molecule-by-molecule. The very precise way in which they are built makes it possible to give these materials unusual electrical, optical, and other properties. And spearheading this new wave are Professor Kroto's remarkable buckyballs. These multi-atom football-shaped cages have joined diamond and graphite as the third known form of pure carbon. Their discovery in 1985 prompted huge interest and has spawned thousands of research papers. Just what exactly they will give us is not yet clear but the promise is there - faster electronics, more powerful batteries, more effective medicines, greener fuel systems, and ultra-strong but ultra-light building materials. As part of his Dalton celebrations, Professor Kroto will teach Manchester schoolchildren how to build models of his soccer molecules. This will be followed by more conventional football coaching with Manchester United players. The Royal Society of Chemistry hopes that through this and other Dalton events, a new generation of chemists can be inspired. Dalton would have approved. He was for most of his own life a teacher. At the tender age of just 12, he had already taken over the schooling of pupils in his home village in Cumberland. "John Dalton supported himself as freelance teacher, lecturer and what we would now call a technical consultant," said Mrs Jones. "He always enjoyed teaching." On the side, he did substantial research. "He was very much his own man and believed in the power of his own observations." Apart from his work on atomic theory, he worked on the atmosphere and weather, keeping a meteorological diary for 54 years with the last entry made the day before his death. Dalton was the first to suggest that colour blindness - he was a sufferer - must be a hereditary condition. His contribution means his form of colour blindness is now sometimes referred to as "Daltonism". So revered was the great scientist during his lifetime that a statue was erected in 1838 in Manchester by public subscription. It cost 2,000 guineas. And when he died, Manchester gave him a huge funeral. It is said 40,000 people filed by his coffin. "Dalton was very much an icon for Manchester. He is probably the only scientist who got a statue in his life time," Mrs Jones said. In this bicentenary year, the Manchester Museum will honour Dalton and his life with an exhibition. An exhibition at the Manchester Museum about John Dalton opens on 14 October. Mrs Williamson-Jones and Professor Kroto will discuss Dalton's impact on science in Material World on BBC Radio 4 on 30 October.